In the earlier version of Spanglefish the Document Library was a public page which combined document management facilities with the display of a document list to users. This was sometimes confusing, so in Spanglefish 2 has been changed and improved, with the two functions being separated. As well as a brand new and much more powerful Document Manager which has it's own dedicated tab on the admin control bar, your site now also includes a Library page which is just used for providing users with a convenient list of the documents that you have available for download. 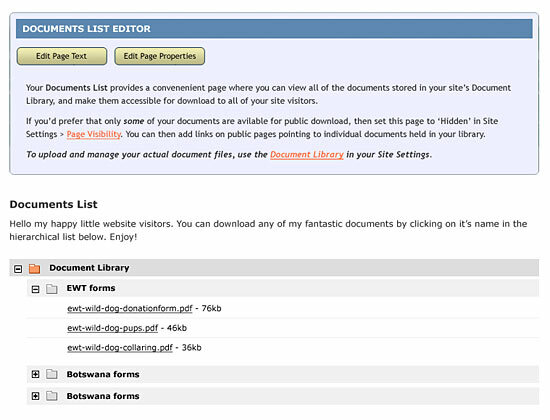 The Library page on your site serves as a convenient public list of documents and files that you might want to share with others, or distribute to prospective customers - such as application forms, publicity leaflets, printable price lists, order forms, etc, and these can be in many formats such as Word, Excel, PDF. If you are editing a new site, your Library page may be switched off by default, and does not appear on your menu. You must first activate the page by going to Site Settings > Manage Pages > Change Page Visibility, and change its status to Visible or Protected before you can use it to display your documents publicly. Once the Document Library page is active and visible on the menu the documents you have uploaded to your Document Manager will be neatly displayed there for easy download. However, you can easily change its status to Hidden, and have links pointing to specific documents added to other site pages. The Library can be a very handy resource. For instance, if you have many users who need the latest version of a document, storing your most-recently-updated 'master' document online means that they can all stay up-to-date with it by periodically downloading it again. NOTE: FREE users are limited to a maximum of 30 files with a maximum data size of 500k per file. When you upgrade to GOLD you can store an unlimited number of documents.